We started off on Friday night with some name and getting- to- know you games, and then moved into making our place-mats for the next day. At each minicamp we arrange the tables for meals by spreading out named place-mats, so that at each meal we have an opportunity to speak to different people, and interact with the JB’s, kids, and leaders. This minicamp we made our place-mats within a getting-to-know-you activity, getting a different person to draw our favorite food, dream job, and what super power we would choose to have. After place-mats we had supper, brushed our teeth, put on our PJs, and grabbed our pillows, and then went back into the main-hall for flag time, and some relaxing time doing lullabies before bed and lights out. On Saturday we started with flag and then breakfast, followed by an activity slot devoted to running games to wake everybody up! One of them was even Harry Potter themed! Lunch was mouse traps – spaghetti, ham and cheese a rolls cut in half. A camp favorite! Onto the third activity: communication was key for this. Half of the kids drew a picture of an alien then had to explain their alien to their partner without their partner being able to talk. The purpose of this activity was to show that one way communication can be problematic and you have to be very clear when giving instructions. If the other person has the ability to talk, ask questions and seek clarifications then communication becomes much easier. The best form of communication is two-way communication! Activity number four was auction game: How do we deal with conflicts? What happens when half of the group wants to buy One Direction but the other half disagrees? The kids were divided into groups. Each group represented a new world they were given some money to bid on a range of items. Their goal – to make their world the most livable world they could. The items they could bid on ranged from One Direction to security to the very important bees. The twist – anybody on the team could put their hand up and bid. Conflicts and disagreements were discussed as well as how different people deal with conflicts differently and this is very important to understand when approaching a conflict or disagreement. After this the kids related what they had learned to their everyday life conflicts on the playground and with their siblings. In every minicamp we try to have a range of activities to suit all different types of learning. Each kid has something that they are passionate about whether that is art, sport or acting. Saturday night was skit night! The crown jewels were stolen from the castle and each group (the cooks, the gardeners, the princess and her friends etc.) had to act out their alibies. It was great to see what creative things each group came up with! Sunday: time for cleaning up, farewells and a game of Cops and Robbers. Each camp we try to give the Junior Branch or JB (aged 14+) a chance to run an activity for the kids. This gives them the opportunity to spend time with the younger group and practice their facilitation skills. A big part of CISV is training. As the future leaders in the organization it is important that we have opportunities for the JB to gain confidence and skills in the planning and running of activities. 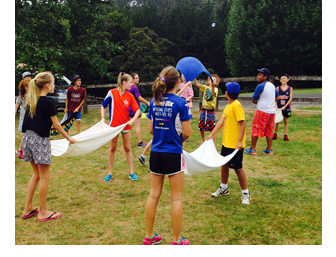 All the children, the JB (Junior Branch) and the leaders were very excited for our first minicamp of the year at Hunua Falls. The camp was full with hugs, smiles and laughter as it is at every minicamp, while everyone got ready for the first activity of the weekend. We started off with some energizers, which are little songs and games to get everyone excited. Then we played some name games so that we all got to know each other. The first one was Bang. This was a great way to learn everybody’s names. For the second activity, we all sat in a circle and the person who started said his/her name and one thing they like starting with the first letter of their name. The second person had to repeat what the first person said and adds their own name and what they like to it as well!! For the last person, it was very hard to remember everything! We then drew our placemats with some hilarious drawings. Next, we all sang lullabies just before bed including some of our favourites like “Leaving on a Jet Plane” and “Hotel California”. The younger group went to bed after the CISV song. The JB then had their night activity run by Zoe and Ellie. This was a fun quiz that consisted off many questions on history, music, movies, natural world, geography and food. We were divided into teams and there were different rules to answer the questions for examples one person from each team had to run to a chair but only after the question had been read out. It was a great race to get to the chair!! The first person to reach would get the first chance to answer. The winning team won a box of chocolates! This activity was an awesome fun starter to the weekend that got everyone comfortable with one another. After flag time and singing the CISV song, we had breakfast before splitting from the younger group for the morning. As JB president for this year, Zoe ran JB’s first activity on Saturday morning. This was a short introduction on the content area and setting some goals for JB. This year, CISV is focusing on the theme of Conflict and Resolution and most activities will be based around this content area and developing our understanding of ‘Conflict and Resolution’. Then Ayesha, JB minicamp planner, ran an activity, which focused on improving our questioning skills to solve conflict. We were split into pairs. One person asked a question but the person answering could not talk and could only answer using hand gestures. We then discussed the questions and talked about skills that are necessary to overcome assumptions to resolve conflict when there are communication barriers. We then had morning tea, which was followed by Charlotte’s activity on HIV and Aids. This was a very informative, well-planned activity where we first discussed the definitions of HIV, Aids, stigma and discrimination. Then we brainstormed the causes, such as misconceptions, and consequences, for example decline of mental health, of the stigma associated with HIV/Aids. The activity ended with a great debate on the stigmas and discrimination we face in our lives today, why these are caused and what are there consequences. After a yummy lunch, kittos (A song we sing after every meal to thank the cooks) and washing up, Mackenzie ran her activity ‘Truth and Lies’. The JB group was split up into three teams and given a list of 10 facts relating to issues in the world, such as poverty. Half the facts were true and half were lies. Each team had to guess which were true and false. We then discussed each teams answers. There were many differing views from team to team. Mackenzie then asked us to all come to an agreement on the ones we disagreed. Lot of us had opposite opinions on some issues so there was a long interesting debate but we finally agreed! This activity was an eye opener for all of us as we were surprised when we find out about the true facts on issues in the world. We then had some afternoon tea and the JB spent some time with the younger kids. Following this Noah, one of our junior-level National Representatives ran an informative activity on the ‘International Scale of CISV’. This covered the hierarchy that exists in different sections of CISV, the positions at different levels and how we can better align ourselves with the international body of CISV this year. 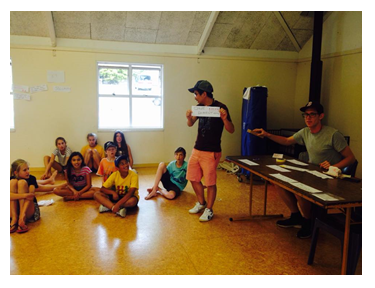 It is a firm goal of the Auckland Junior Branch to become more educated about CISV beyond our own chapter, and Noah provided a great first step in achieving this. We had a delicious dinner of spaghetti bolognese followed by jelly and ice cream! Then we had our favourite, Saturday Night Skits. In this activity, which was run by Ayesha and Zoe, we were split into groups and each group was given a person working in a palace (e.g. guards, cooks). Each team then had to prove to the jury, which was the lovely kitchen staff, in the form of a play, why they had not stolen the King’s crown and what they may have seen that proved their innocence. The teams were also given a language and a Disney movie that they had to incorporate. It was a lot of fun and everyone got very creative! After this, we sang lullabies and the Juniors went off to bed. The JB then had a fun training facilitated by Bronwyn and Ryun. They started of the training by showcasing a bad facilitation to us. We thought it was their actual activity but they were illustrating to us things that may make our facilitation bad. Then we discussed the things that they did wrong and what makes a good facilitation. We all learnt many new skills on planning activities and now feel much more confident to do so! We then played a few games and went off to bed. On Sunday morning after flag time and some breakfast, we cleaned out our cabins. The JB then had their minicamp evaluation where we talked about what went well, the skills we learnt and what can be improved for the next minicamp. We then had our final activity with all the children and the JB’s, which was ‘Cops and Robbers’. Planned by Sachin, Max, Zoe and Aria, this is a CISV classic and so much fun! Half of us where assigned as robbers and the other half were cops. The robbers had to get money from one side of the field to the bank on the other side. But the cops could catch them and take their money if they tagged them and guessed where the robber had hidden the money on herself/himself. Everyone got a chance to do both and this was a great finish to an amazing minicamp! follow #myCISVstory on Facebook, Twitter and Instagram to understand how people got involved with CISV.